1969 Camaro project car hunt leads to barn find First-Gen in New York. 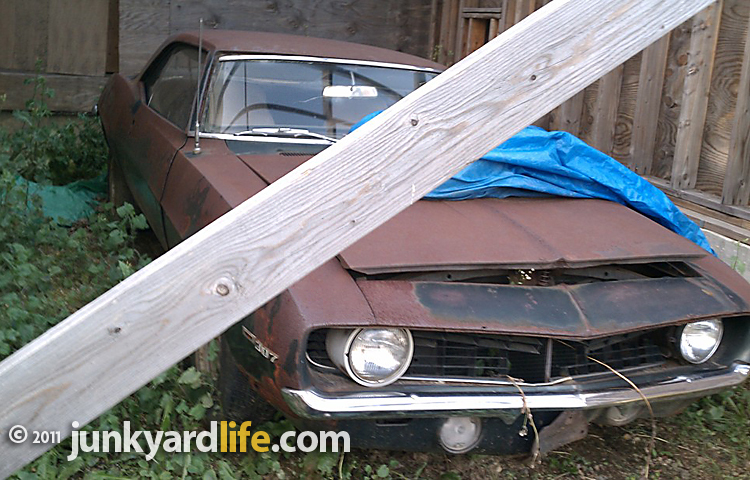 Gary K., of Long Island, New York, followed up on a tip about a '69 Camaro parked beside a vacant house in an upscale suburban neighborhood. Gary took a short drive and found this black X-44 1969 Camaro equipped with a 4-speed manual transmission, white bucket seats, 307-V8 and 2-barrel carburetor. Surprisingly, the car sits 20 feet from the road in a makeshift garage that has no door or roof. The house, adjacent to the Camaro's framed fortress, appears to have been abandoned in the middle of a renovation. "The neighbors say the owner stops by sporadically to check his mail," said Gary. "They have no idea who he is and only know the guy by his first name." 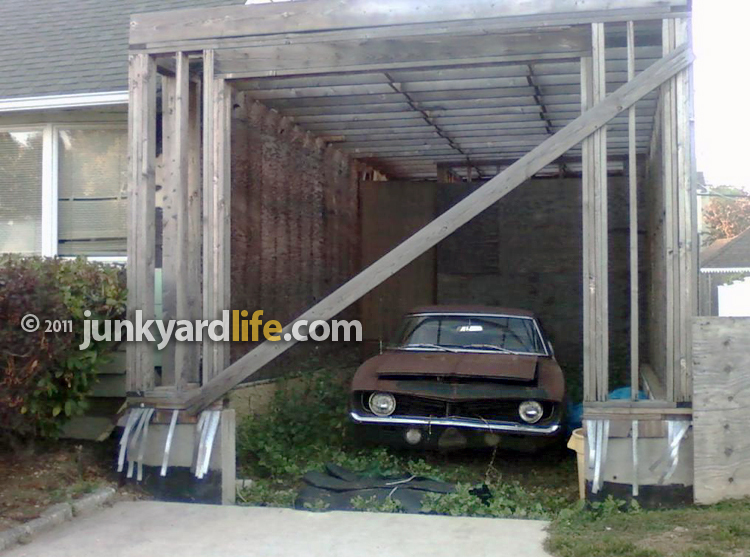 This project 1969 Camaro looks out of place in this meticulous, suburban Long Island, New York neighborhood. Gary battled bees, bugs and poison ivy to get a closer look at the Camaro. "I was already being eaten alive by the killer mosquitos when I ventured into thick brush to get a better look at the car," said Gary. "I noticed the door handles and rear spoiler were missing. Also the rear window was shattered, which is not a good thing since the garage does not have a roof. The decaying interior was white with bucket seats and a console." Gary thinks the car is restorable, despite rust and body damage. 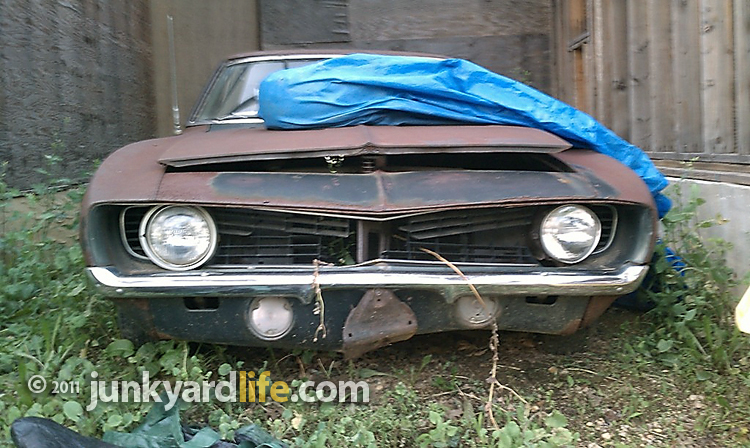 "The header panel is bent and the bottom of the fenders and quarter panels have some rot." 1969 Camaro with a 307ci V8 and a 4-speed. Unwilling, rusty hood hinges hampered Gary's efforts to look at the trim tag on the firewall. 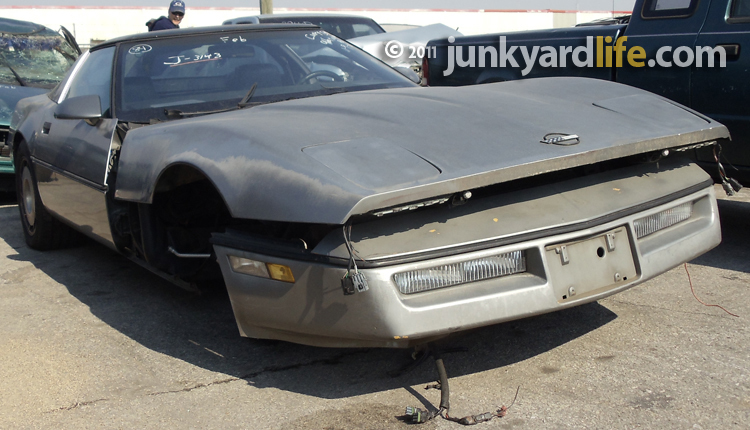 "I was able to lift the already popped hood, which was almost seized shut," said Gary. He spotted the X44 code on the cowl tag, denoting it a base model Camaro. X44 cars could be ordered with 230ci/130HP or 250ci/155HP in-line six cylinders engines or 327ci/210HP, 307ci/200HP, 350ci/250HP or 350ci/255HP V8 engines. A pair of 307 cubic inch badges on the fenders squash any dream that this could be an X44 COPO, (Central Office Production Order), Camaro with a 427ci big block engine. Pennsylvania's famed Yenko Chevrolet ordered 201 COPO Camaros for 1969. Those were equipped with an iron block 427-cubic inch L-72 engine and a 4.10 Positraction rear end. 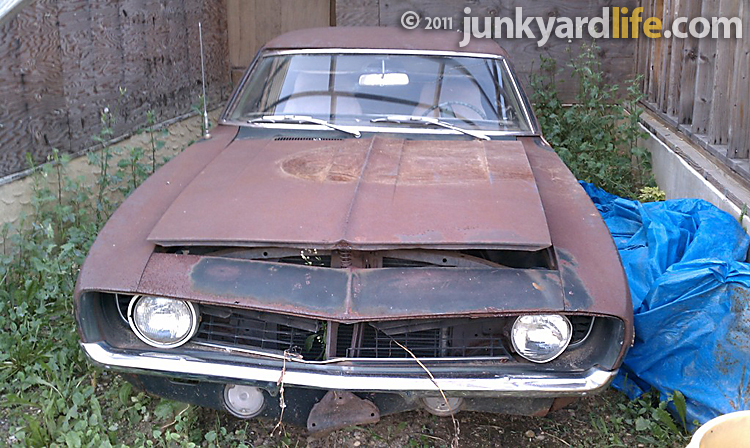 Documented Yenko COPO Camaros currently fetch $250,000 USD or more at classic car auctions. Factory 1969 Camaro tuxedo black paint is giving way to a not-so-fresh coating of rust. A note was left for the owner to call if he was interested in selling the '69 Camaro. Gary has realistic expectations. "Most of the cars I find are 'gonna be restored one day,' as the owners often say," said Gary. "The very few that are for sale are over-priced. Most of the people don't understand the costs associated with restoring a car properly, sometimes upwards of $40,000. 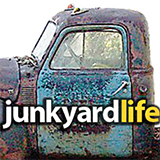 They watch Barrett-Jackson and assume every plain Jane, rust bucket, commands 100-point, restored, rare model prices. I call this Barrett-Jackson-itis." Astronomical first generation Camaro prices inevitably trickle down to some body's grandma's clapped out, Frost Green six banger. 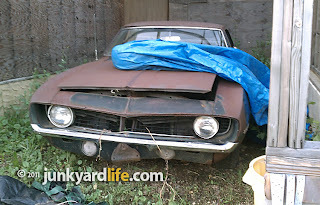 Sure it's still a 1969 Camaro but shelling out ten grand before you turn a wrench or pick up a parts catalog is too painful for most. Beater 1969 Chevy Camaro projects command high prices. I feel your pain Gary. Keep leaving your phone number and have fun searching, there's always another classic car to discover. 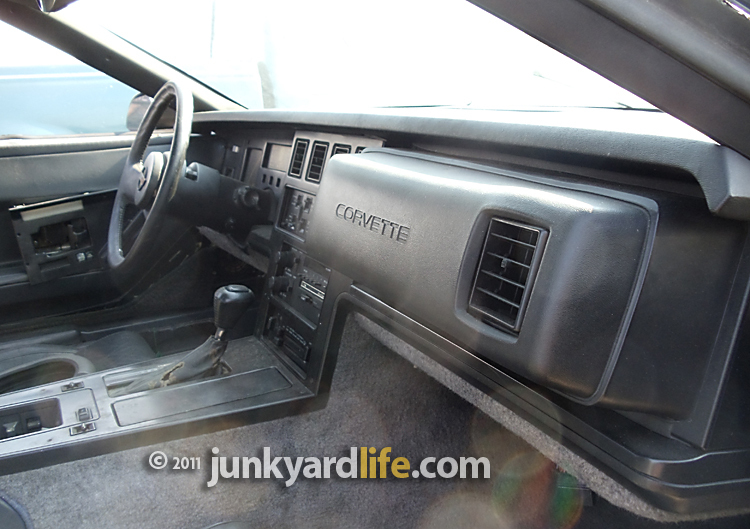 1984 Corvette: Intelligent design or bugly? 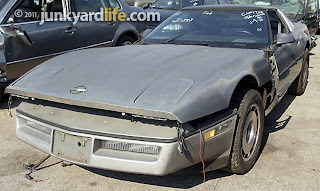 Corvette sold for parts, goofy, giant dash pad intact. Scoring a cheap Vette at the local car auction is everyones' dream. 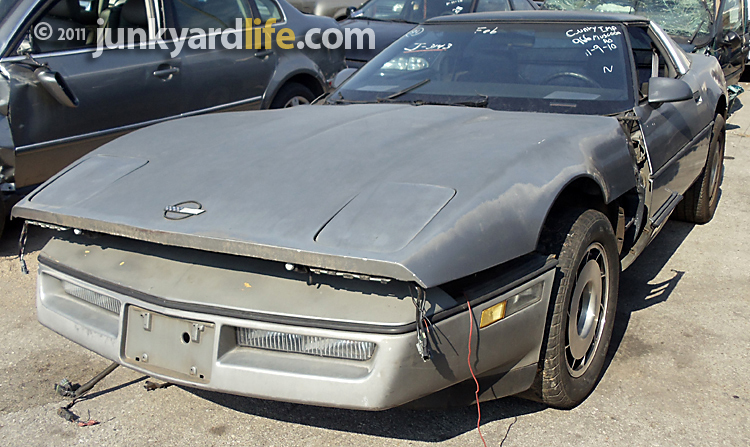 I had a chance to live the dream when I spotted this 1984 Chevrolet Corvette at a Birmingham, Alabama wrecker company up for bid. The faded silver bullet suffered some front end damage and was minus the 350 cubic inch, 205hp engine that makes early C4s forgettable. One glance at the bulbous, 4-inch thick passenger's side dash pad and I knew this Corvette was doomed. 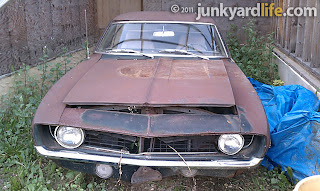 Another eBay parts car, to be resold in bits and pieces, with the remnants sent to the scrap yard or landfill. Insert your joke here or leave a comment below. 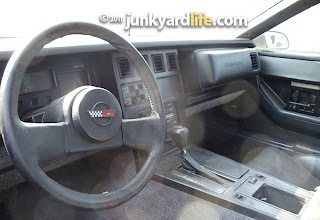 The '84 Corvette dash pad is embarrassing. Quit your complaining... But its a Corvette! 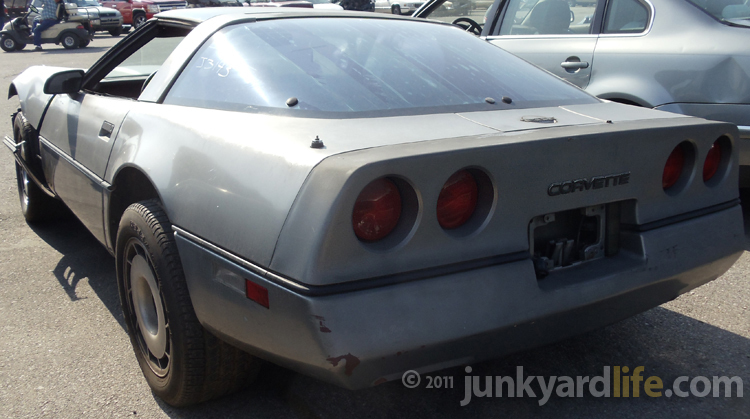 Chevrolet completely redesigned the Corvette for the 1984 model year. Forward thinking designers and engineers equipped the car with revolutionary, (for the time), handling, braking and safety features. The dash pad was GM's idea to meet future Federal safety guidelines as a passive restraint system. The restraint proposal was eventually dropped by the Reagan administration but GM, in a hurry to get the 1984 model out the door, went ahead and built the new Corvettes with a safety feature like no other. All Corvettes should have round tail lights. How many 1984 Corvettes were built? The new '84 plastic fantastic reached the second highest production total for Corvettes with 51,547. Only the 1979 model topped it in sales at 53,807 built. Buyers were eager to get back into a Vette after the aborted 1983 model year. Drivers rocked out to Van Halen and overlooked the giant dash pad as they gazed deeply into their digital dash. Absence makes the heart grow fonder but in hindsight would you pay the base '84 Vette sticker price of $21,800 again? 1984 Corvette with 4-speed Automatic transmission. Where did this '84 Vettes engine go? My guess, this was a theft recovery.